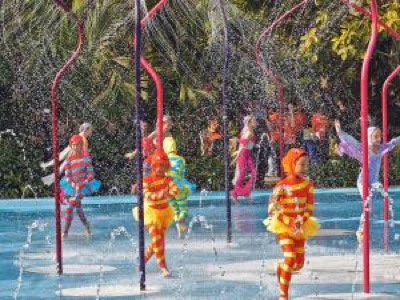 This children's day was exceptionally important for the girl as she was performing at the Gardens by the Bay together with the Singapore Ballet Academy (SBA). 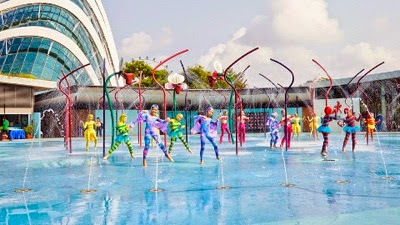 The ballet school was invited to perform a piece at the Gardens by the Bay Children's Garden for children's day and being part of the the Junior Youth Performing Group (YPG), she was one of the young dancers involved in the dance piece. The girl has been training with SBA for just about a year now. She started sometime in September last year after I switched her from another ballet school. Since then, I have been very happy with her progress and although we spend three days a week at the school, I can see how her passion is being developed and enriched. She is currently in grade 2 and at the same time, is part of the YPG. SBA started the specialized group sometime at the start of 2014 and it "is a newly added initiative aimed at refining and nurturing potential young talents into fine artists of Contemporary and Ballet genres. The program forms an intensive training ground for aspiring dancers to cultivate their body, mind and soul towards a capacity that expresses top-notch performance quality. As the dancers progress further along the program from Junior group (Grade 1) to Senior group (Intermediate to Advance), future opportunities will be in the form of exchange programs with overseas academies and dance schools, introduction to Classical Ballet techniques, Contemporary and Classical Pas de Deux, Classical repertoires and newly created works that can be featured in local and overseas performance, as well as participation in dance competitions." This is the first performance for the Junior YPG group and it is supported by some of the older girls from the Senior Group who were dancing the roles of the mermaids. The little dancers trained very hard over the last three months for the performance. They were personally taught by the principal of the school, Mr. Jeffrey Tan, "one of Singapore's most prolific and established dancer, choreographer and educator". The group performed first in the morning for the VIPs and then in the afternoon, they danced a second time in the late afternoon for the public and of course, the parents of the dancers came out in full force. We quickly put together a video of the performance to share how proud we are of our little girl. She is one of the fish in the red and blue costume. In addition, they were mentioned in the local media too! Such an awesome experience for my little ballerina. I am sure she is looking forward to more possibilities and exposure. And as a parent, I am fully supporting her in the realization of her dream.